I hope the poor RV dog can adapt! We rescued our poor puppy from the pound months before we went full-time- and we started in a hotel room with the dog! We had never intended it to happen that way. We wanted to stay home...the Lord had other plans. I'm so glad we didn't know what they were because we never would've gotten our beloved pet and he has been so fun to have on the ride. He is part beagle so I understand the wanting to run. 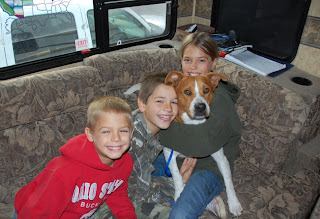 He only scared us to death a couple times when he shot out the camper door before we could get his leash on him. Terrifying, but thankful he didn't run too far.